by Marcelo Tonon Chiovatto, Sao Paulo, Brazil. 116L (31-Gallons). Winner of the 60 – 120L Category and Best of Show. Cropped view. Olympic-class aquascaping demands a Renaissance suite of skills: mastery of aquatic technology (filtration and lighting), water chemistry, specialized horticulture, captive fish husbandry, and aquarium photography. Above all, it calls for a sense of aesthetics—or as some put it, a blue thumb and a good eye. 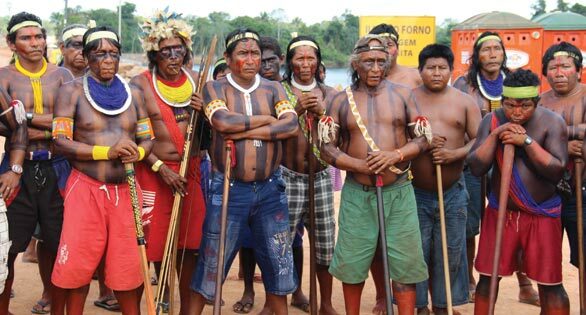 AMAZONAS March/April 2014 with this article in print or digital editions. See bottom of page for ordering link. Click for enlarged view. 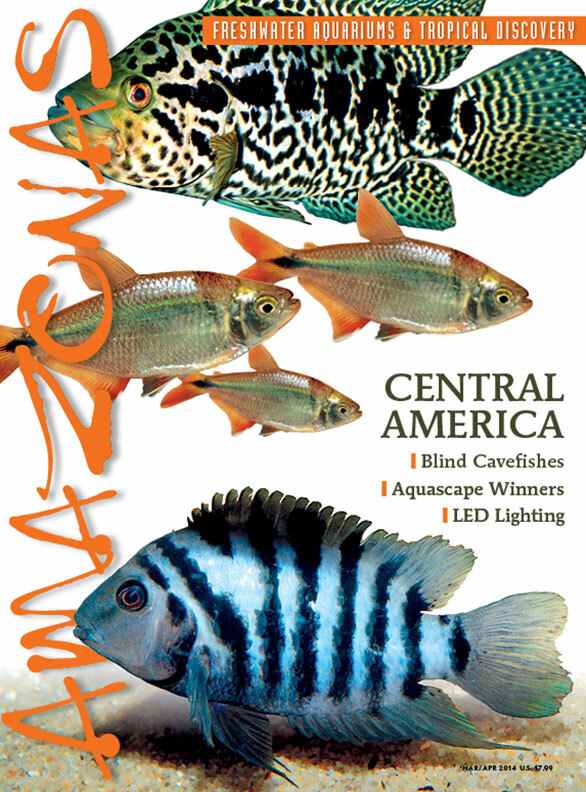 Once dominated by American and northern European aquarists, the contest has taken on a truly international flavor, with entrants from Croatia to Turkey to Vietnam, with Brazil making a particularly strong showing. 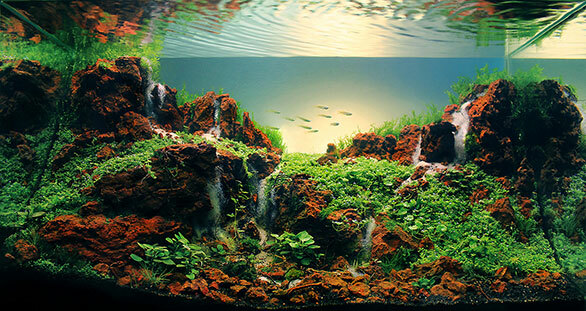 The most-innovative aquascape, entitled “Sky,” came from Wang Chou of Hong Kong, shown on page 58. 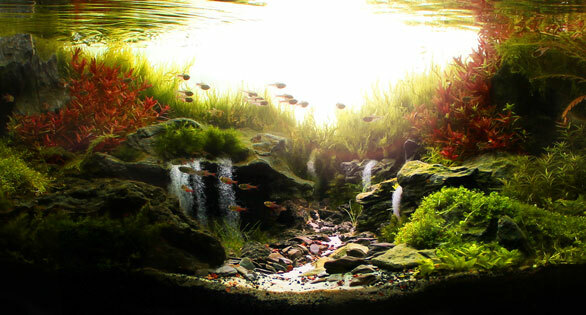 A number of entries employed animated effects, as in the Best of Show winner above, by Marcelo Tonon Chiovatto of Sao Paulo, Brazil, with multiple simulated waterfalls. The judges were often critical of any sort of mechanical gimmickry, but awarded high marks when the techniques were employed effectively. 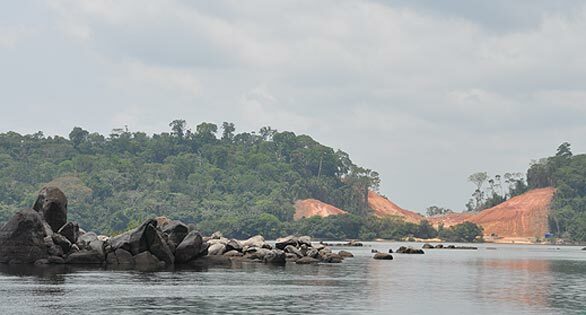 Judging of the submitted photographs was done by Dave Chow (China), Luca Galarraga (Brazil), Karen Randall (USA), and Mike Senske (USA), with sponsorships from Seachem Laboratories, Brightwell Aquatics, The Hydra Forum, and AMAZONAS Magazine. A portfolio of the leading submissions assembled by Erik Olson can be found online here. The category winners follow below. “Sunrise in the Valley” by Marcelo Tonon Chiovatto. Full-frame image showing scope of the aquascape that impressed judges. Additional Information: CO2 Eden, 2 bps, fertilization Seachem Excel, Potassium, Trace, Iron. Karen Randall: This is a stunning tank. I do not usually like fake waterfalls and the like, but this is beautifully done. Absolutely magical! Luca Galarraga: This layout transmits peace and tranquility—when I see it, I remember scenes from a lost untouched paradise. When your work awakens this kind of emotion, you achieve the highest level in aquascaping. This is ART! Perfect color, perfect use of space, perfect use of plants (the H. pinnatifida fits like a glove). The only point that can be improved upon in my opinion is the foreground left side. Perhaps some small details there would make it more interesting. Congratulations for this masterpiece! Mike Senske: I am not a big fan of the waterfall look. It adds a bit of whimsy to an amazing layout, but I feel it detracts from the scape. Otherwise very nice. “A Pocketful of Sunshine” by Paulo Victor Pacheco, Sao Paulo, Brazil. 7 gallons (25-L). Luca Galarraga: Impressive work in such a small space! The use of open space and the image reflected in both side glasses is excellent! The only negative point is the position of the fishes, it could be better. Congratulations for this wonderful work! Dave Chow: This tiny rockscape is small but detailed, the plants are growing well too, it looks very fresh and comfortable. Best! “Seven Falls” by Fabian Kussakawa, Foz do Iguacu, Parana, Brazil. Dave Chow: This year there are many waterfall scapes in several contests. Some people commented that adding artificial materials to the scape is not appropriate, but I think if the scape is good-looking and skillfully made, like this layout, then I will accept it! Luca Galarraga: Excellent work, with good use of space and creativity. The negative point is the weak contrast between fishes and background (the background color makes the layout a little sad…) Well done! Mike Senske: The ratio is well done. I like the use of the red stone. It is a refreshing contrast. “Cove” by Robertus Hortano, Singapore. Dave Chow: This mountain scape conveys the grandness of nature, through the use of not only small foreground plants and moss but also some stem plants. This helps give the layout a different kind of perspective! Luca Galarraga: Lovely work, with excellent use of space, strong hardscape, and good plant choices. Excellent natural feeling, congratulations! “Overland” by Andre Luiz Longarco, Sao Paulo, Brazil. Plants: Callitriche sp., Hemianthus callitrichoides “Cuba,” Eleocharis minima, Hydrocotyle tripartita, Echinodorus tenellus “blood,” Hygrophila pinnatifida, Elatine triandra, Bucephalandra sp., Limnophila sp. “Vietnam,” Ludwigia glandulosa, Rotala sp. “green,” Rotala indica, R. rotundifolia, Staurogyne repens, Hottonia palustris, Microsorum pteropus sp., Taxiphillum sp. 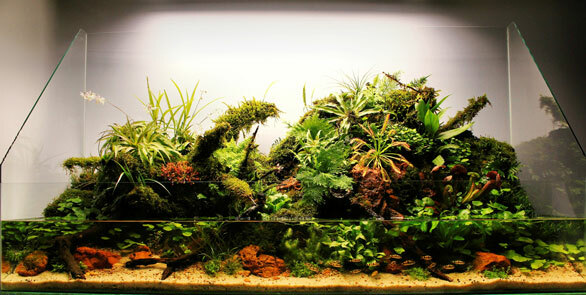 Dave Chow: This scape demonstrates that an iwagumi (stony) layout can use many different kinds of plants instead of just one or two species. It turns a complicated combination into a simple look with total harmony. I feel very comfortable after seeing this layout!. Luca Galarraga: This layout is full of details and shows meticulous care. The whole aquarium is impressively healthy. The right side of the layout is very strong and natural. The left side looks a little artificial. Unfortunately, the photo was taken a few days too early, before the background stem plants had a chance to achieve their best shape. The use of space and images reflected on both side glasses is very skillful. Congratulations, great work! “Destiny” by Senai Johor, Malaysia. Filtration: 2217 with ADA BioRio, 2217 with ADA BioRio, 2215 with lava rocks for CO2 inline diffuser. Additional Information: Fertilization with KNO3, Seachem Trace and Iron. The small twigs used as “vines” in this aquascape are hardwoods that can last for months in water without decaying. They have been part of the aquascape since day one. This aquascape was 4+ months old when the photo was taken. Plants: Microsorum pteropus sp., Anubias barteri var. “nana,” Bucephalandra sp., Eleocharis sp., Hemianthus callitrichoides, H. micranthemoide, Fontinalis antipyretica, Fissidens fontanus, Bolbitis sp. Dave Chow: Impressive work, very natural, full of details, and a lot of work inside to keep this layout in excellent condition. The only negative point is that it isn’t an original layout, but still, congratulations for this masterpiece! “Sky” by Wang Chou, Hong Kong. Dave Chow: This layout shows a different point of view that I haven’t encountered before. I appreciate this kind of originality. Luca Galarraga: This is a very original layout! It surprises us with the unusual point of view. I can imagine the difficulty of fixing the driftwood in the right positions. Congratulations! Mike Senske: Amazing perspective. Congratulations! “Tuquan Meets Susquehanna” by Geoffrey Gallo, Lancaster, Pennsylvania. Additional Information: My objective was to recreate the environment found along the banks of my favorite fishing hole, where Tuquan Creek enters the Susquehanna River. Everything in the tank is native and was gathered on family’s and friends’ properties in the area—the fishes were caught on hook and line, the crayfishes were hand-fished. Decorative Materials: Substrate is composed of various sizes of local rocks, sand, and silt. Driftwood is from dredging projects near local oak-lined riverbanks. Rocks are quartz schist, abundant and predominant in only a small area of southeastern Pennsylvania. Karen Randall: BEAUTIFUL representation of this habitat! Phil Edwards: Now THAT’s what I call a biotope tank. While I don’t know the aquarist, I live somewhat near Lancaster County and am also off the Susquehanna. This looks JUST like what I’ve seen in local streams. “Nature Resting” by Luidi Rafael de Souza Dolm, Ponta Grossa, Parana, Brazil. Plants: Hydrocotyle leucocephala, Lobelia cardinalis “small form,” Hottonia palustris, Cryptocoryne crispatula var. “balansae,” Rotala sp. “Vietnam,” Ludwigia glandulosa, Echinodorus uruguayensis, Lilaeopsis brasiliensis, Myaca sp. Ponta Grossa, Ludwigia inclinata, Staurogine sp., Bolbitis heudelotii, Samolus valerandi, Echinodorus tenelus, Scindapsus sp., Cryptanthus microglazioui, Orthophytum foliosum, Cryphaea tenella, Vesicularia ferriei, V. dubyana, Lomariopsis lineata, Fissidens sp., Pecluma sicca, Nephrolepis exaltata “Marisa,” Osmoglossum pulchellum, Selaginella kraussiana (Kunze), Sarracenia sp., Drosera intermedia, D. capensis (Darwiniana). Karen Randall: LOVELY tank, and a good attention to both the land and water sections. Nice choice of fishes! Dave Chow: Well-organized layout! The plant arrangement is good both above and under water! 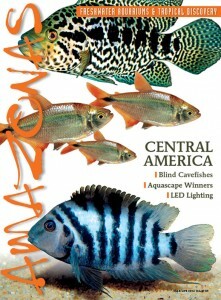 To Order the print or digital copy of this issue of AMAZONAS, click to visit the Reef to Rainforest Reader Shop.